Their leaves provide us with awesome shade during the stinking heat of summer. One of my favourite spots to be, if only the flies and mozzies would leave me alone. 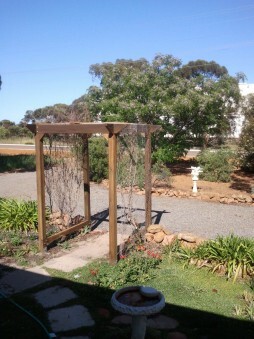 I have another one out the front but it fends for itself without water and it does it’s best to grow in our horrible clay ground. Nasty stuff that clay, you should see the cracks in our house!! 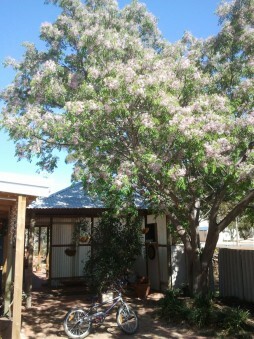 My mum has a massive lilac tree, which my brother and I always climbed. I had this spot where I could lay back against a curved branch and enjoy the peace and quiet. That poor tree endured our climbling endeavours as we used it like a playground. Every kid should climb a tree! It’s funny how certain things stick with you, and it’s the love (and sometimes hate relationship) I have for these tree’s that has carried over into my fourth book. It just magically appeared into my main street and planted itself next to one of the main buildings in this town. Oh well, at least it’s providing shade for my characters, can’t have them roasting in the summer sun. I’m only up to chapter 6 so I best be off to do some more. The wonderful Jo, who’s doing the edits on The Road Home, is off on her honeymoon so I have some time before I get them back. So I’m back off to the small town of Bundara to see where my characters are going next. Also don’t forget to check out my facebook page for the link to Blog Bites where the wonderful Kez gave me a list of questions. I am giving away a couple of books to those who comment.